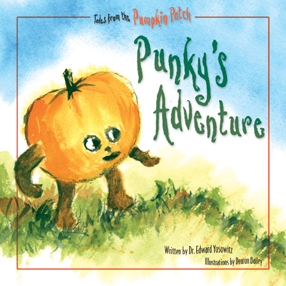 Punky’s Adventure, written by Dr. Edward Yosowitz, is the story of a young pumpkin’s adventure to find himself. Punky was born and raised on Farmer Brown’s farm in Indiana. After being harvested and sent to market with his family, he soon realized he didn’t want to end up a holiday treat. Punky wanted to be something different. During his travels, he happened upon Mrs. Gowdy’s orphanage. The children immediately adored him. While there, Punky became who he wanted to be, which made everyone very happy. Punky’s legacy will live on forever at the orphanage. Punky’s Adventure is also available in Spanish.